Nowadays, rack mount enclosure (or rack enclosure) is widely used in enterprise data centers, server rooms, schools, etc. to manage network cables. As one of the most popular options, 1U rack mount enclosure is a priority choice in many situations. 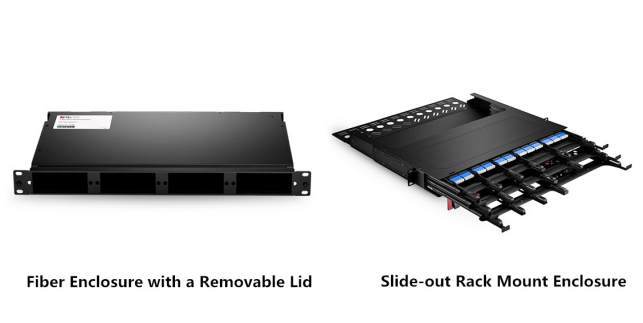 While, normally, there are two styles (slide-out style and removable style) of enclosures in the same 1U rack space. Then, how to choose a proper one for your cabling? Next, let’s take the comparison on two types of FS 1U rack mount enclosures as an example. FHD-1UFMT-N is one of the FHD series products that self-developed by FS.COM. The FHD series products focus on easy-to-manage high density fiber cabling. It is a cost-effective and reliable solution for fiber cable management in data centers, server rooms, CATV (Cable TV), etc. FHD-1UFMT-N is a 1U rack mount enclosure with an easy-to-move cover. That is to say, this rack mount fiber patch panel has a removable lid. You can remove its cover and then organize your cables with different solutions. 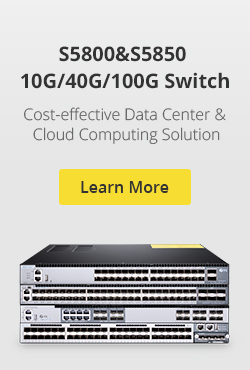 It can hold up to 4 x fiber adapter panels or 4 x MTP/MPO cassettes of up to 96 fibers for cable management. 1) It enables fiber splice tray installation and removement. In addition, one FHD-1UFMT-N enclosure can hold up to 4 splice trays. 2) It can hold up to 2 slack spools for cabling. 3) It supports high-density cabling management with up to 4 MTP or MPO cassettes. FHD-1UFCE enclosure is also one of the self-developed products provided by FS.COM. This 1U rack mount enclosure offers you easy and quick installation within its 1U space. FHD-1UFCE is a 1U rack mount enclosure with a parallel sliding drawer. Compared with the normal design with removeable lid, this unique design saves your time and energy without removing the top cover whenever installation is needed. You can slide the drawer out and then install matching products to organize your cables with ease. It can hold up to 4 x fiber adapter panels or 4 x MTP/MPO cassettes of up to 96 fibers for cable management as well. The main uses of this 1U rack mount enclosure are the same as FHD-1UFMT-N rack enclosure. 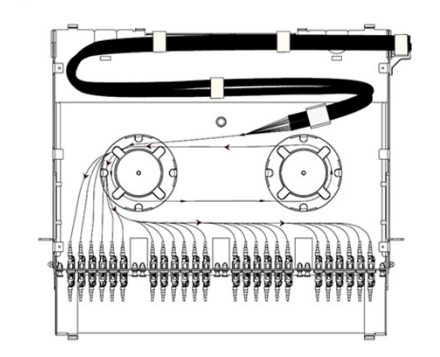 The FHD-1UFCE supports patch cord connections with slack spools, storage of spliced fiber pigtails and cabling management with MTP or MPO cassettes as well. Normally, these two styles (slide-out style and removable style) of enclosures have much in common. However, they still differ from each other. 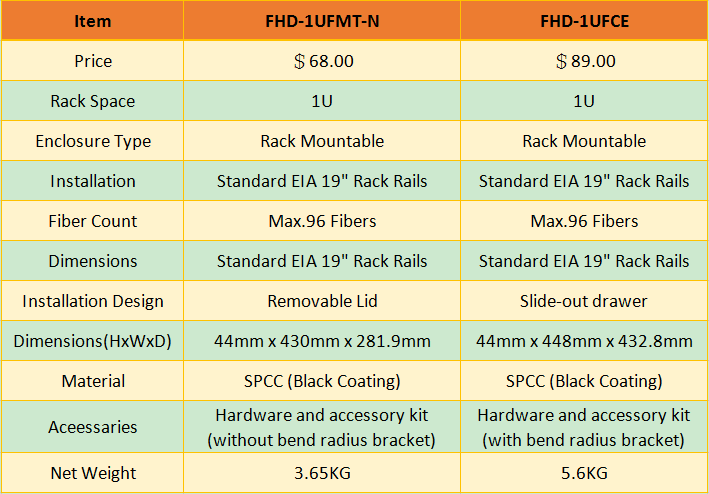 For 1U rack mount enclosure choosing, you can take many factors into consideration. As for FHD-1UFMT-N vs FHD-1UFCE, the main applications are the same. They both can be used for patch cord connections, storage of spliced fiber pigtails and high-density MTP or MPO cabling management. Therefore, you can focus on their differences in price, installation design, dimensions, weight, etc. By the way, FS offers other rack mount enclosures such as 2U, 4U as well. You can choose a proper fiber enclosure according to your actual needs. This entry was posted in Cable Management, Fiber Optic Enclosures and tagged 1U rack mount enclosure, Fiber Adapter Panel, fiber patch panel, rack mount enclosure on November 16, 2018 by Fracy.Yin. How to Choose the Right Rack Mount Fiber Enclosure? Fiber enclosure can provide easy-to-manage cabling environments and strong protection for fiber optic cables. Since more and more cables used in today’s data centers, high-density cable management tools also become more popular and essential than before. However, there are so many fiber enclosure manufacturers and suppliers, and the rack mount fiber enclosures supplied therefore available in different sizes and applications. How to choose the rack mount fiber enclosures for your network? The rack mount enclosure is generally made for standard 19 inch rack mounting. Depending on the number of connections required, they are available in one or more rack units (RU) height configurations, such as 1RU, 2RU or 4RU, etc. See the picture below, you should choose the most proper one depending on space and port requirement of your network. 1RU rack mount fiber enclosures are the most commonly used size in data center server racks cable management. For convenient installation and cable management, there are cover removable, slide-out and swing-out three mount types fiber enclosures to choose from. The cover removable type is an early type of fiber enclosures. If your budget is sufficient, I will recommend you to use the slide-out type or swing-out type though they are more expensive than the cover removable type. But you may get more benefits during installation and maintenance, as they respectively feature a convenient slide-out support tray and an integrated swing-out tray so that you don’t need to remove the whole enclosure from the rack to gain internal access. Fiber enclosure has various designs and applications. There are mainly three ways to use the fiber enclosures, which are depended on the accessories that are installed on the fiber enclosure. The following will take a slide-out 1RU rack mount fiber enclosure as example to illustrate the applications of the fiber enclosures in data center. Installed with splice trays, fiber adapter panels and MTP cassettes separately, fiber enclosure can provide cabling environment for different connections. Installing four fiber adapter panels on the front panel and one or more splicing trays inside the enclosure drawer. 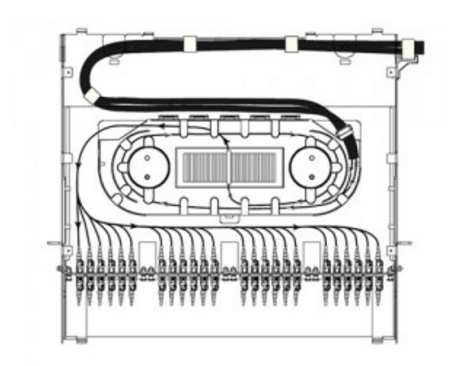 This fiber enclosure can provide cable management and protection for splicing joints and connections. Installing two spools on the enclosure drawer and four FAPs on the front panel, this fiber enclosure can provide flexible high density cabling for fiber patch cables. Up to four MTP Cassettes can be installed in this 1U fiber enclosure, which can provide 40G/100G to 10G high cabling density and easy transferring from MTP interface to LC interface. After reading the passage, we know that rack mount fiber enclosures may be available in different sizes, mount types and applications. Thus to choose a right fiber enclosure seems not a simple thing. FS.COM offers a wide range of rack mount enclosures, as well as custom service, which can help address all kinds of your requirements. For more details, please contact us via sales@fs.com or call 24/7 Customer Service: 1 (718) 577 1006. This entry was posted in Cable Management, Fiber Optic Enclosures and tagged cable management, fiber enclosure, rack mount enclosure on September 2, 2016 by Alice.Gui. Just like copper-based cabling systems, fiber-optic cabling systems have a few specialized components, including fiber optic enclosures and connectors. Because laser light is dangerous, the ends of every fiber-optic cable must be encased in some kind of fiber optic enclosure. The fiber optic enclosure not only protects humans from laser light but also protects the fiber from damage. Wall plates and patch panels are the two main types of fiber optic enclosures. We’ll discuss patch panels here. When most people think about a fiber optic enclosure, a fiber patch panel comes to mind. It allows connections between different devices to be made and broken at the will of the network administrator. Basically, a bunch of fiber-optic cables will terminate in a patch panel. Then, short fiber-optic patch or interconnect cables are used to make connections between the various cables. There are dust caps on all the fiber-optic ports, which can prevent dust from getting into the connector and interfering with a proper connection. Patch panels come in many shapes and sizes. Some are mounted on a wall and are known as surface-mount patch panels. Others are mounted in a rack and are called rack mount patch panels. Each type has its own benefits. Surface mount panels are cheaper and easier to work with, but they can’t hold as many cables and ports. Surface-mount patch panels make good choices for smaller (fewer than 50 drops) cabling installation. Rack-mount panels are more flexible, but they are more expensive. Rack mount patch panels make better choices for larger installations. Patch panels are the main products used in LAN installations today because they are extremely cost-effective and allow great flexibility when connecting workstations. 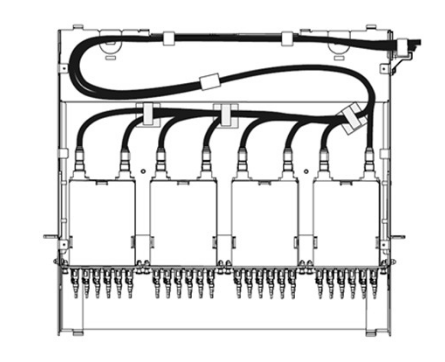 In addition to the standard fiber patch panels, a fiber-optic installation may have one or more fiber distribution panels, which are very similar to patch panels in that many cables interconnect them. However, in a distribution panel, the connections are more permanent. Distributions panels usually have a lock and key to prevent end users from making unauthorized changes. Generally speaking, a patch panel is found wherever fiber optic equipment hubs, switches, and routers are found. Distribution panels are found wherever multifiber cables are split out into individual cables. 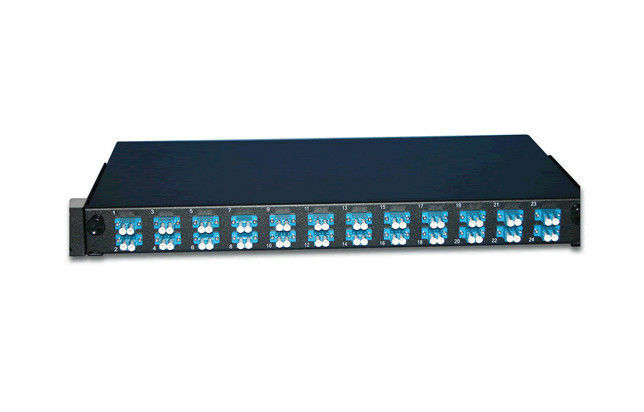 Here is the example of 24 port patch panel. Our wall mounted fiber optic enclosures accommodate up to 8 modular panels and is equipped with routing guides to limit bend radius and enhance strain-relief control. The 16-gauge steel with corrosion-resistant black powder finish coat housing provides excellent protection for the inside fibers. Wall-mount available unloaded, as well as having the capability to become a full-splice enclosure with mechanical terminations. 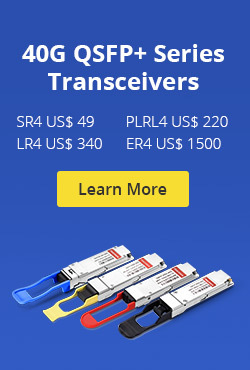 A large variety of connector adapters are offered to meet your specific requirements. Such as SC, FC, ST, LC, etc, we can also pre-install various kinds of fiber optic pigtails inside the patch panel. We offer a series of changeable inside panels to fit for different kinds of the adaptor interface, and fit for both round and ribbon fiber optic cables. This entry was posted in Fiber Optic Enclosures and tagged 24 port patch panel, Fiber Optic Enclosures, fiber patch panel on October 23, 2014 by Amelia.Liu.